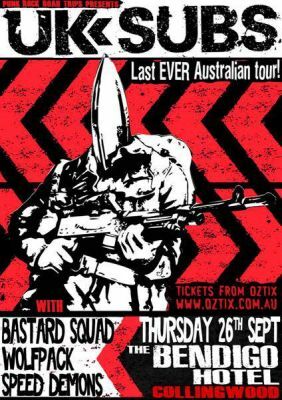 With the UK Subs about to embark on their final tour of New Zealand and Australia in September/October 2013, Time & Matter's Marc Brekau, who himself lives in Australia, presents an interview he did last year with the New Zealand based tour promoter Tim Edwards, of Punk Rock Road Trips. For many bands, a visit to Australia and New Zealand can be a rewarding and engaging experience. 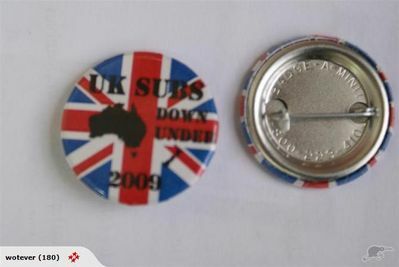 Despite the tyranny of distance from England – both countries are located on the bottom right hand side of the global map – Australia and New Zealand continue to remain high on the ‘must tour’ list for many of today’s punk rock bands. 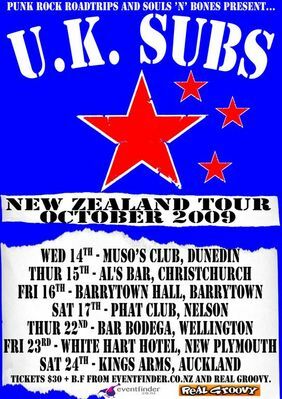 Despite the problem of distance, and the cost associated with touring, many bands have successfully toured around Australia and New Zealand. 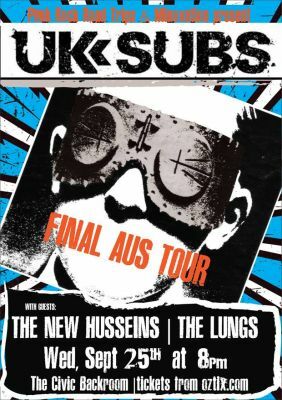 Often employing the punk ethos of ‘low budget, no budget’, their tours have been sustained through the generosity of fans, and the revenue generated from ticket and merchandise sales. 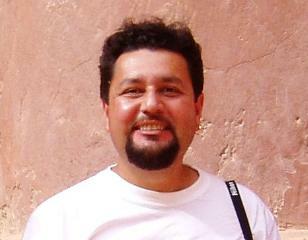 Some tours lose money, some break even and occasionally, just occasionally, some make a profit. I first encountered Tim after seeing The Business play Melbourne's landmark venue The Tote, at the tail end of 2011. While watching the band, I had stood beside Tim at the PA, but I didn’t know who he was per se, or that his company, Punk Rock Road Trips, had organised this tour. After the gig I emailed Tim via his website, seeking the return of my entrance ticket. A strange request I know, but I have always retained my ticket as a reminder of the gigs I have attended. 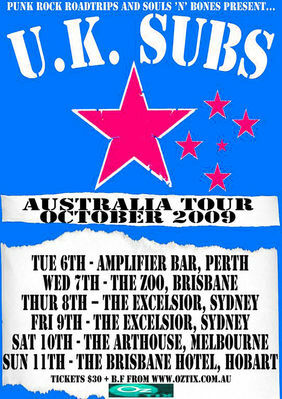 Being the friendly and obliging chap he is, Tim kindly posted me a signed ticket from the gig, and then revealed that he had toured the UK Subs in Melbourne (and across Australia) in 2009. I had also attended that gig, and as a fan of the band I dropped him a line seeking an interview for the Time and Matter website. 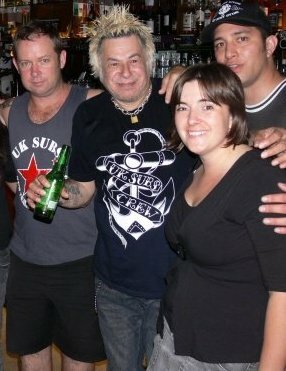 He kindly agreed, and I am indebted to Tim for his time and insights on the UK Subs, and their adventures down under. So how would you describe your business? ‘Basically, Punk Rock Road Trips is a one-man promotion band that tours punk bands as a hobby (with a little help from my friends, of course). A key feature is that I only tour the bands I like, mainly bands I grew up listening to in my youth from the 1980’s and 90’s (the UK 82 era bands, as a guide). I try and organise a couple of tours each year, in between managing my day job and my family, which is not so easy as I have two young children now. But I’ve done okay so far, and that keeps the momentum up for future tours’. From a business perspective, what objectives do set for the bands that you tour? Over the years it seems the band have sustained themselves using a 'low budget, no budget' approach to touring. Is that how you found them on the 2009 tour? 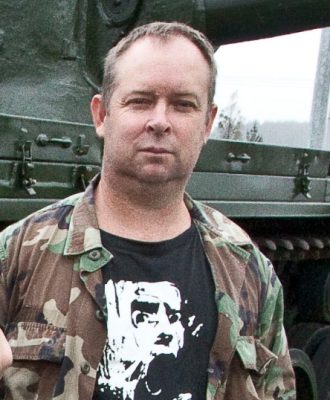 Tim paints an interesting picture about life on the road as a tour promoter and manager, and the challenges of managing tours for a band like the UK Subs. 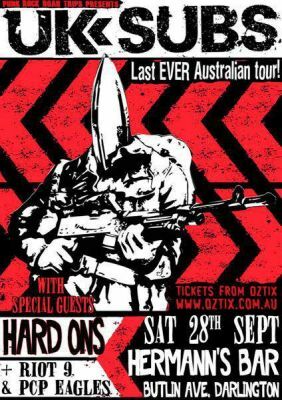 Bands that rely on his talents when they tour down under. Without Tim, they may not have toured as frequently as they have done, and hopefully will continue to do so. Marc Brekau and Tim Edwards, June 2012.